I wonder what it was like having a roundhead live next door? Samuel Pepys, that garrulous Naval clerk who confessed all to his diary for a decade in Restoration England, conveniently chooses to understate the fact that he played truant from school so that he could go and watch the Regicide of Charles I. But come the Restoration he was an upstanding moderate, who lived, coincidentally, next to another upstanding moderate. 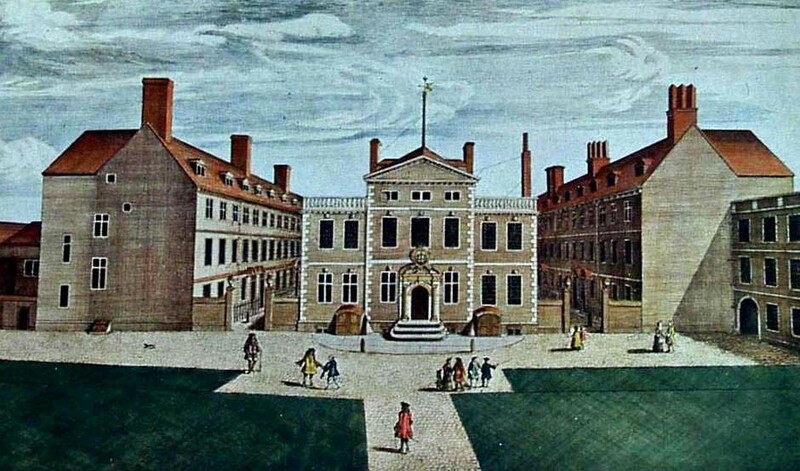 His next door neighbour was Sir William Penn; a roundhead who supported the return of Charles II. He was present on the Naseby, the ship owned by the Earl of Sandwich which was sent over to the Dutch Republic to fetch Charles II back home. The goings on between the two households, the Pepys and the Penns, are constant cause for amusement in Pepys diaries. Sir William was a Commissioner of the Navy Board, and Pepys was its Clerk. They were thrown together at work, as at home, in Seething Lane. And Pepys did not like Penn. He called him a ‘mean fellow’. At home, too, relations did not run smoothly: “At night home, and up to the leads [roof], were contrary to expectation driven down again with a stinke by Sir W. Pen’s shying of a shitten pot in their house of office”, writes Pepys, frankly, in 1665. Sometime in a long career ending in 1670, Penn managed to lend the King a not inconsiderable sum of money. But he never collected: it was his son who was proffered a large tract of land in America, including today’s Pennsylvania and Delaware. His son. William Penn. William the extrardinary, the visionary, the thinker, the Quaker, the founder of a state; William who had to be rescued from debtor’s jail, who died penniless a few miles away from where I write, in a little place called Twyford. And William, whose grave lies in the Jordan’s Meeting House cemetery, at a village called Chalfont St Giles, in a rather beautiful corner of England. There could not have been a more different character from the irascible general who lived next door to Samuel Pepys. Tomorrow, I shall jump in the old Merc and motor off in serach of more of the story of the man who gave Pennsylvalia its name. Posted in Quirks of HistoryTagged Chalfont St Giles, england, history, Pennsylvania, Quakers, Samuel Pepys, Sir William PennBookmark the permalink. And I can’t wait to read it. Pennsylvania was our first home in the U.S. after emigrating from England. Fascinating stuff. I have never been there, Jennifer, but it’s a must on my itinerary! I must say, Kate, that there’s not a lot to see in Pennsylvania, except, perhaps for the city of Philadelphia (I have never been there, actually, but I hear things), unless you are a fan of Little League Baseball. We settled in Williamsport (William Penn again? ), which is the home of LLB and where the championships are played every year. I am looking forward to more of your thoughts on this subject. Penn had a huge influence on Colonial America and also many of my ancestors. Love this one. All totally new to me. But then again, I can place Seething Lane in my mind (somewhere in the City) whereas I could not place Pennsylvania on the map, outside of North America. I look forward to more. Quakers had best relationship with Native American Indians of all English groups that migrated and were very active in 1800’s anti slavery movement. I met them today. Wonderful, warm community, Carl: very inspiring. Because the area was wooded- and I think it was named by Charles after Penn’s Naval father, rather than after his Quaker son. I have to look all this stuff up to write and then I forget about it straight afterwards, IE. I expect I’ll be asking you about him this time next week. Lovely. We lived in Cherry Hill . . . just cross the river from Philadelphia Pennsylvania, which gave us a chance to visit Dickens Pub, visit the Liberty Bell, and troll round Rittenhouse Square. I think the diary includes mention of atempted seductions, Kathy, but I believe the two had no truck with it. I must have a little ferret through the diary and find out more for you. Quakerism: for the younger Penn, it was a conversion. Amazing story. Very amazing, and an interesting read. and here we thought we had Penn all to ourselves. Isn’t it amazing there’s a whole length of life beyond the tidbits we know about a person? He was born and died in England, though I believe his heart was in America and he lived there for long parts of his life, Deborah. As a native Pennsylvanian, and as someone who admires William Penn (the son), I look forward to your post, Kate. An admirable human being, Judy!